Packetization of MPEG sections into Transport Stream packets. Sections are provided by an object implementing SectionProviderInterface. [in] pid PID for generated TS packets. [in] provider An object which will be called each time a section is required. Set the default PID for subsequent MPEG packets. Get the default PID for subsequent MPEG packets. PID for generated TS packets. Set the object which provides MPEG sections when the packetizer needs a new section. Get the object which provides MPEG sections when the packetizer needs a new section. The object which will be called each time a section is required. Set the continuity counter value for next MPEG packet. This counter is automatically incremented at each packet. It is usually never a good idea to change this, except maybe before generating the first packet if the continuity must be preserved with the previous content of the PID. [in] cc Next continuity counter. Get the continuity counter value for next MPEG packet. Check if the packet stream is exactly at a section boundary. True if the last returned packet contained the end of a section and no unfinished section. Build the next MPEG packet for the list of sections. If there is no section to packetize, generate a null packet on PID_NULL. [out] packet The next TS packet. True if a real packet is returned, false if a null packet was returned. Get the number of generated packets so far. The number of generated packets so far. Get the number of completely packetized sections so far. The number of completely packetized sections so far. Reset the content of a packetizer. The packetizer becomes empty. If the last returned packet contained an unfinished section, this section will be lost. 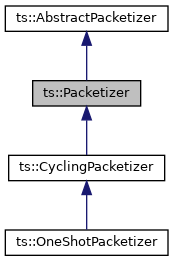 Display the internal state of the packetizer, mainly for debug. [in,out] strm Output text stream.